Former oyster shucker Billy Marinelli is an environmental evangelist preaching not to save souls, but the sea. The New York native, who owns a seafood restaurant in Thailand's capital, is on a crusade to get people to stop eating fish and other sea creatures whose numbers are quickly declining. Marinelli says this is a critical issue not only for the 1.2 billion people relying on seafood as their main source of protein, but for the billions of others whose eating preferences have created the situation. “They're now predicting in 20 to 25 years we will be out of fish. This is Armageddon. This is the end of the world as we know it,” he exclaims. Marine biologists studying the issue offer a slightly longer timeline before stocks of most commercially viable species crash - but the general consensus is that will happen by 2050, at the current pace of destruction. A decade-long study issued in 2010 compiled by more than 2,000 scientists in 80 countries, the Census of Marine Life, asserted that 90 percent of the larger fish populations have already vanished, mainly due to overfishing. Just what is considered sustainable seafood can be difficult to precisely describe. In general it excludes wild species that are overfished, caught by bottom trawling, dredging or longlines (which can also kill many birds, turtles and marine mammals). Farmed seafood is sometimes considered sustainable, but many aquaculture operations damage the surrounding marine environment, use artificial feed and have high levels of chemicals and antibiotics. Thailand's shrimp ponds have faced particular scrutiny. In response, some now are closing off their systems, filtering their ponds and composting waste. Marinelli is skeptical about the water quality in Thailand's ubiquitous shrimp ponds and is especially passionate about contaminants in farmed salmon. He is trying to entice diners with recipes featuring items traditionally not considered very appetizing. “I have three types of seaweed in this restaurane. I'm cooking jellyfish, Western style. We will have to be forced to change the way in what we eat and the quantities that we eat," he says. Marinelli has been involved in aquaculture since his days as college undergraduate in the mid-1970's when he helped Native Americans try to re-populate native oysters in Shinnecock Bay in New York state. In The Oyster Bar restaurant, Marinelli says his display case has a substantially different lineup from what he put on ice a few years ago. Desirability, quality and rarity have combined to generate eye-popping prices for some endangered fish. A Japanese sushi restaurant chain owner last year paid nearly $1.8 million for one bluefin tuna weighing 222 kilograms. Environmentalists say all three species of bluefin are currently overfished. Asia is a key target for campaigners, both in terms of production and consumption. 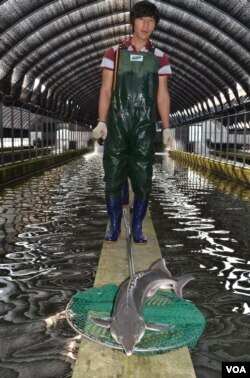 More than 60 percent of all farmed seafood in the world is produced in China. Another quarter of the total comes from the rest of Asia. Asia's fishing fleets are largely blamed for the overfishing that has led to 85 percent of fish populations being overexploited. More than two-thirds of the world's seafood is consumed in Asia. Marinelli has been recruiting well-regarded chefs of upscale restaurants in Thailand to take the sustainability pledge. With some of them at his side he plans to hold a news conference in Bangkok in November to formally launch his campaign under the banner of the Monterey Bay Aquarium's Seafood Watch program. Marinelli, whose company is one of the largest global distributors of half-shell oysters, says when he explains the dire situation to restaurant professionals they are amazed, especially the veterans. One of his young converts is Nan Bunyasaranand, who runs a popular American-style eatery in Bangkok named Little Beast. Taking a break after pan-frying a North American wild-sockeye salmon, a sustainable species, Nan explains that quality is her primary criterion for selecting food, and wild fish and other seafood just happen to taste better. “There's a lot of farmed fish industries in Thailand. I've used them before. And the quality is just not as good. The salmon I had when I was younger and the salmon today is so drastically different," Nan says. She acknowledges the difficulty restaurateurs and market customers, especially in a country such as Thailand, have in discerning what is sustainable because of the lack of reliable certification and information. She says she makes an effort to talk to all her suppliers to get information about where the items come from and how they were caught or raised. She has some advice for other conscientious chefs as to how to start along the path of sustainability. “If you personally think that it's good enough to feed you and your family then I believe that that's the bottom line, right?” Nan says. Although sustainability mentor Marinelli is concerned time is running out, like a patient preacher, he is pragmatic about the task confronting him and his acolytes. A tangible example of progress is some restaurants and hotel groups in Asia removing shark fin from their menus, despite it being a popular soup item in Chinese cuisine. Thai Airways in July banned shark fin as a cargo item in its planes.